I don't know why the middle section of one appears to be upside down. But I like that they're a little quirky. And that the one looks like a pear.....maybe I'll use it in the nursery. $3 for both. wow - i love them - not seen anything like it - i lurve white glass. well done bargain girl!!! Oh la! la! I love them! What a score! Reminds me of milk glass! $3 for both? That is awesome! P.S. Just stumbled accross your blog and I am in LOVE! SO pretty! What a fabulous find. Ooooh! That's milk glass!!!! 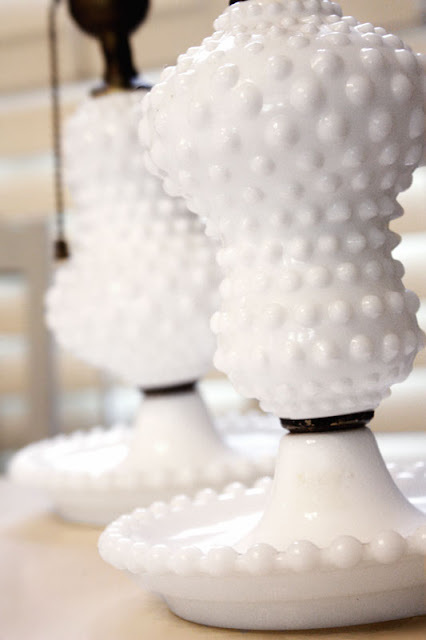 GREAT price for milk glass! Love em!